15 years ago, when I was watching how Star Trek heroes were controlling the computer using their voice, I was amazed. It was like magic to me. They could literally make the machine do something using only voice. After launching 3 years ago, there’re already 25 million Amazon Echo devices sold only in the United States. And in 2020 there’s gonna be 130 million users around the globe. Apple, Google, Alibaba, Microsoft, Samsung — every single one of these companies are opening their own platforms. They are investing a lot of time and resources in R&D because they believe in the future of voice. And we see the result. We see how voice is disrupting our existing user experiences and bring new, hands-free paradigm, on the table. In 10 years, everything in your home will be controlled by your voice. Your car, favorite restaurant, hotel, conference room, office. Voice is going to be everywhere. And it’s already happening, all BMW cars in 2018 will have Alexa on board and Wynn Las Vegas hotels already use Echo in rooms. But the creation of voice apps is still broken. You have to be a developer to build a voice app. You have to know how to set up a server, integrate intents & entities and configure interaction models. We believe that you don’t have to know how to code to build voice applications. We are developers and our job is to build tools. 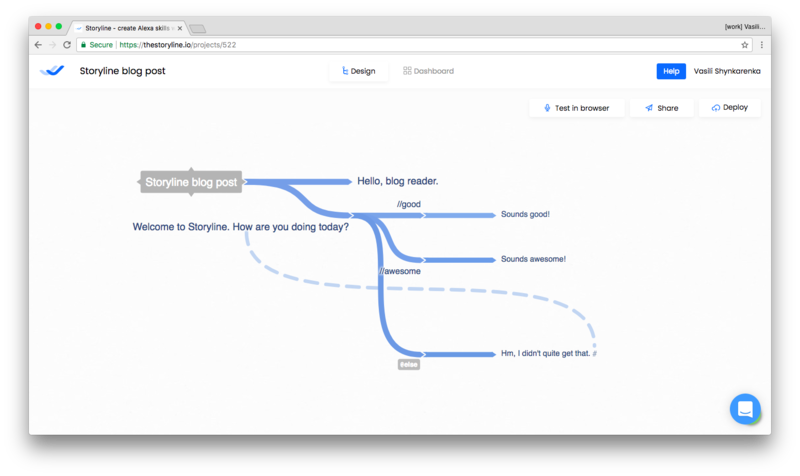 Tools that other people can use to make something faster, simpler, or cheaper. Maxim Abramchuk and I have been working on a new company and product to solve this problem for the first time. 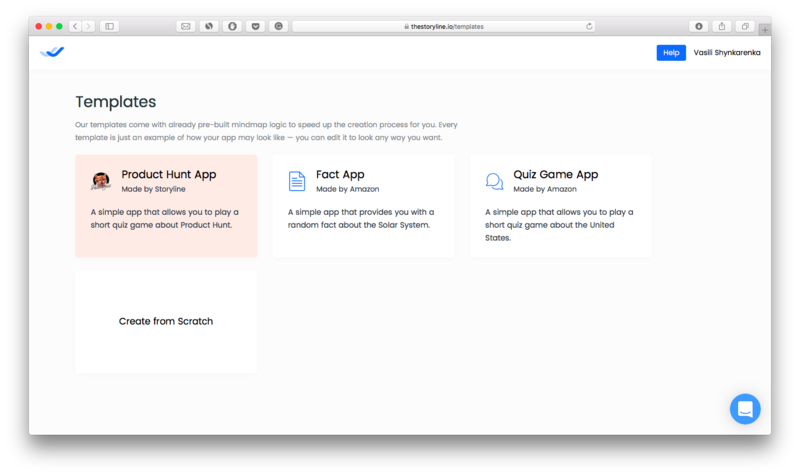 After a simple login, you can create a voice app from scratch or from templates. 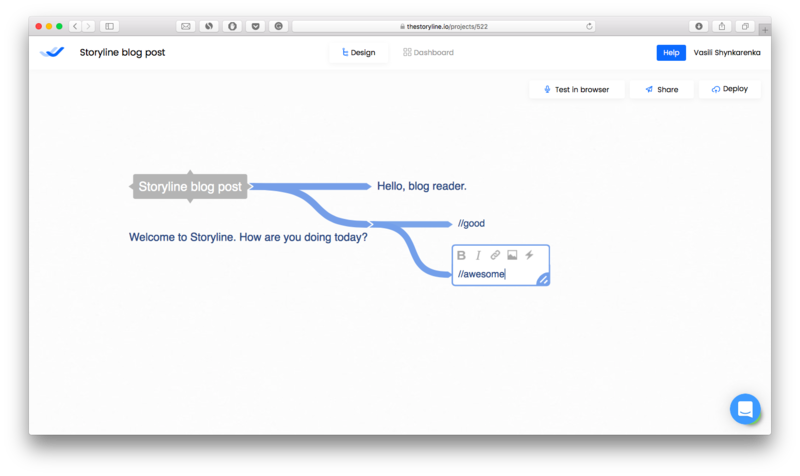 Our vision for templates is a way bigger: it’s something people are going to use to share ideas, projects, and even make money from them. If you go from scratch, you can easily add new app responses (something that your voice app is going to say) using the plus button on the main node, and just typing what you want your voice app to say. And if you want to create a user request (something that user is going to say), you simply do that by hovering your mouse over the last app response and clicking the plus button. 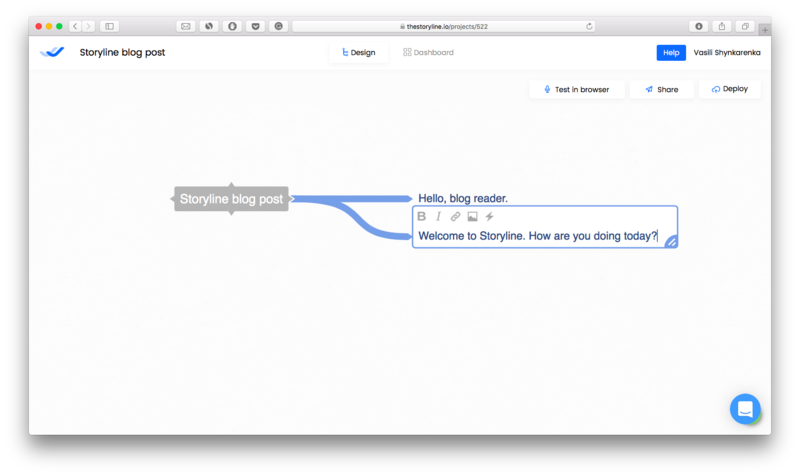 Mark the user response with “//“ symbol, that’s how Storyline understands what is what. On the screenshot below, I have 2 user requests: “//good” and “//awesome”. And as you have already guessed, you can create an app response for that user request. And that’s basically it, with this logic you can create almost anything that comes to your mind (check out templates if you need inspiration). 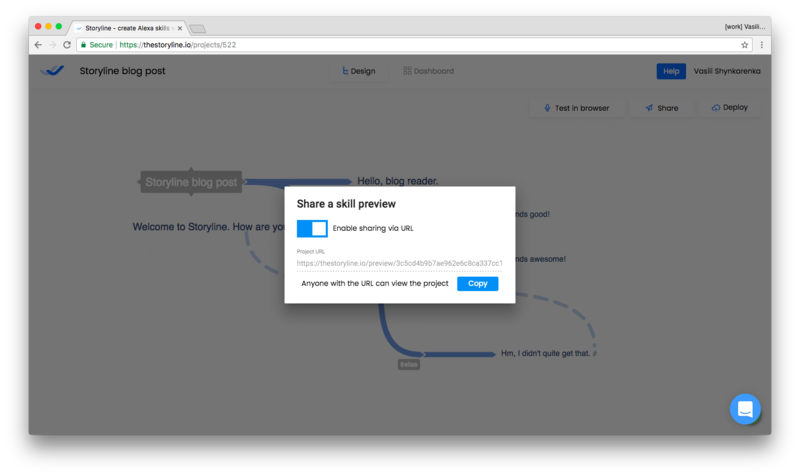 Now you have a working voice app that you created in 30 seconds. 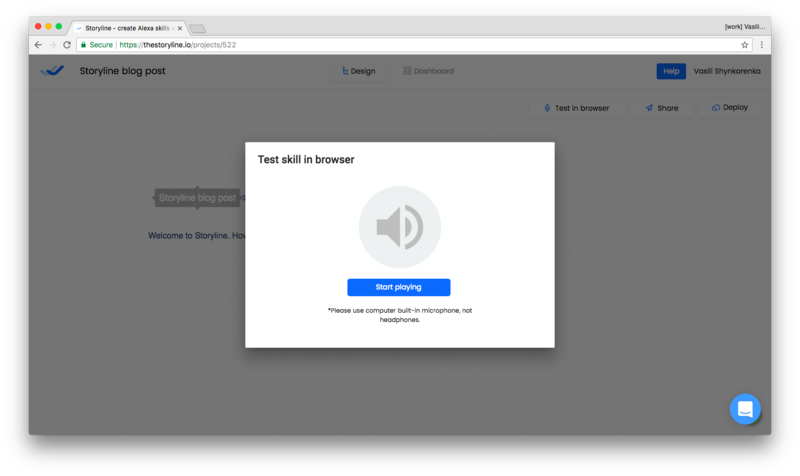 The best part is that you can actually talk to it using Test in browser feature. It gives the user an ability to actually feel the app, play with it and instantly fix something that sounds bad. You see that blue dotted line going from the very last message? That’s a message link. It helps the user to create logical connections and complex navigation in voice apps. I did one more thing here: @else statement catches all responses besides yes or no. After that, Storyline generates you a simple landing page that you can share with friends, open on your mobile device to show to someone, or send to a client to get his feedback. 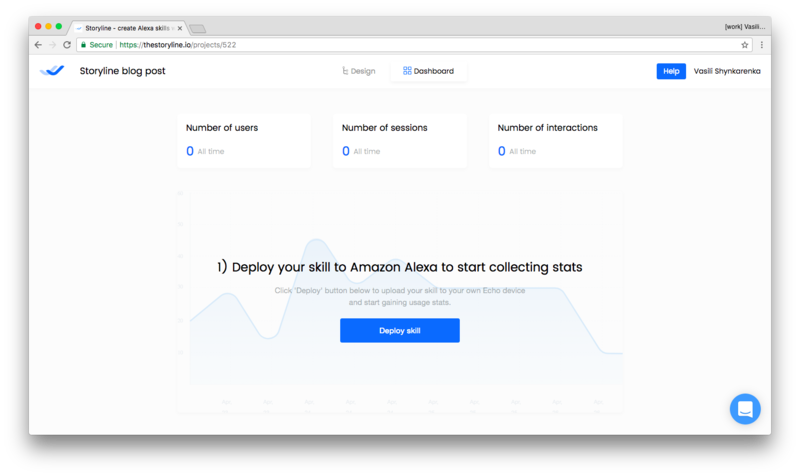 The other part of Storyline product, Dashboard, helps you to publish your app on your Echo device or directly to the Amazon App Store and monitor statistics. And that’s amazing because it opens a door for your voice app to reach more people. And this is all available today. We’ve built a lot of software. And we can be completely wrong about this approach. But we feel that this problem is worth solving and sometimes you have to take a leap of faith. Thanks to smart folks Amir Shevat, Artem Goldman, Mike Melanin, Dmitry Hursky, Andrei Kulik, Adam, Brayton Williams, Maddie Callander and Jacob Hansen, you helped a lot. 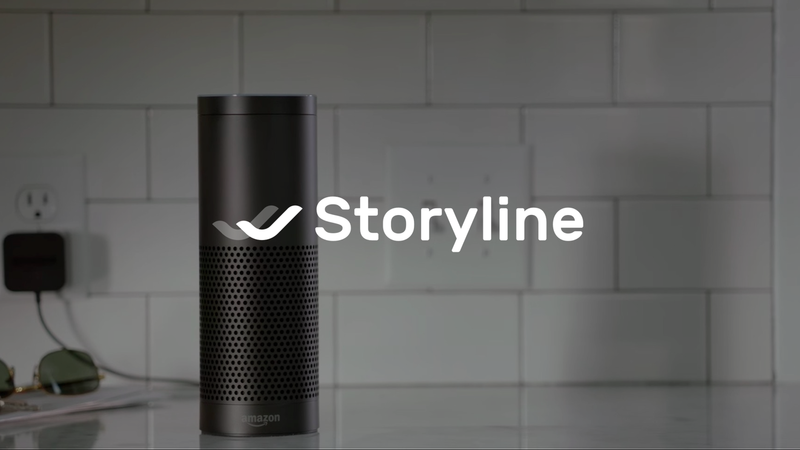 Sign up for Storyline today and let us know if we’ve simplified the process of creating voice apps. If you like what you read be sure to 👏 it below — as a writer it means the world.